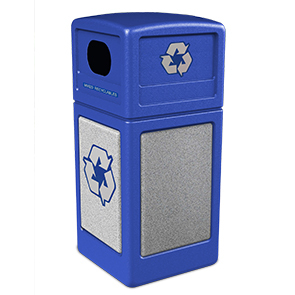 This durable recycling receptacle is molded from polyethylene and panels made from fiberglass-reinforced polymer concrete. Smooth panels add approximately 40 lbs for greater stability and are extremely easy to clean. 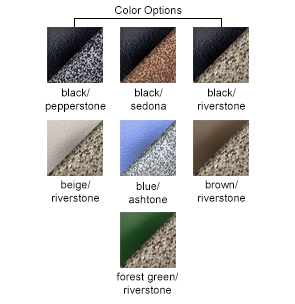 Black and blue trash cans come with pepperstone panels, beige comes with riverstone panels. Includes seven decals: Plastic Bottles, Aluminum, Glass, Plastic Bags, Paper, Mixed Recyclables, and Trash, to create a personalized recycling center. Connecting hardware available upon request to connect two or more units for a complete recycling system. The receptacle has a 42 gallon waste capacity and uses 39 gallon trash bags. Patented Grab Bag™ system holds bag in place, eliminating bag slippage. Extremely durable, perfect for indoor and outdoor use. Double-Sided opening measures 7-1/2"W x 5"H.